Home » News » Vivo Apex to be launched with the name Vivo Nex? Earlier this year, Vivo launched its newest innovative smartphone called Vivo Apex in China. The smartphone offers an impressive 91% display-to-body ratio and is equipped with a fingerprint scanner at the bottom of the screen (and scanner half-screen), and a self-pop-up camera. The Smartphone will come with Qualcomm Snapdragon 845 processor support based on LPN 10nm process technology with clock speed up to 2.8GHz and paired with Adreno 630 GPU, 8GB RAM. And a smartphone running FunTouch OS 4.0 developed by Xiaomi (based on the Android operating system v8.1 Oreo). Recently, the device was seen being used by passengers on the subway, and his photo viral online. 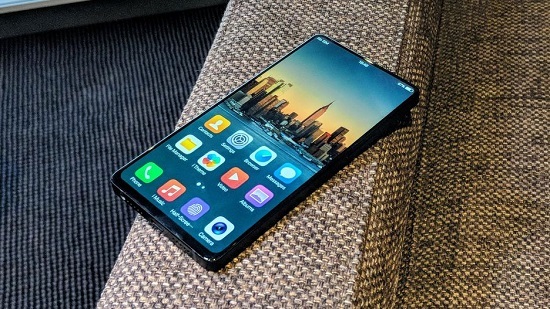 From the leaked photos revealed that Vivo Apex will come with a 3.5mm headphone jack, which is placed on the top side. This smartphone will feature a 5.99 inch OLED display with COF technology and ambient and proximity sensors embedded beneath the screen. Interestingly, half of the screen is integrated with the on-screen fingerprint reader, unlike Vivo X20 Plus UD which has only one dot at the bottom of the screen. At the top edge of the screen, there is a hidden selfie camera that can be raised when needed. The front camera takes only 0.8 seconds to pop-up. However, based on the leaked image, it seems Vivo will make small changes in the design of the phone. For example, the corners of the handset now have a rounded edge compared to the square edge of the prototype model. So, the Vivo Apex prototype model you see in the Mobile World Congress (MWC) event is not a fixed design, because there will be a small change in the design. Well ahead of its scheduled launching day at an event in Shanghai, China on June 12, 2018, a news came out that Vivo has decided to change the brand (re-brand) of its next-generation smartphone. And reportedly, Vivo Apex may be launched under the name "Vivo Nex". Vivo has registered the trademark "Vivo Nex" for the smartphone category since last year. But for this smentara there is no further confirmation associated with the change of name Vivo Nex. Not long ago, Vivo said that Vivo Nex will go into mass production during mid-2018. 0 Response to "Vivo Apex to be launched with the name Vivo Nex?"